With illegality found throughout the dog meat supply chain, the animal welfare NGO has been alerting the authorities to lawbreakers with stunning results. When an Animals Asia investigation in 2015 revealed the scale of illegality in the dog meat trade, the charity knew it had a new resource to use in efforts to end the consumption of dogs and cats. The investigation revealed many dogs are poisoned when stolen from homes or snatched from the streets and have no proof of origin or vaccination histories as required by law. Since then, the Hong Kong-based charity has reported 1,039 dog meat restaurants in 52 cities across China which they suspected of illegality. More than 150 government departments responded with 72% of cases being accepted. As a result 126 restaurants have been ordered to close or stop selling dog meat due to illegality in their business dealings. All reporting since 2017 has been carried out by Ya Dong Consulting, an enterprise wholly owned and advised by Animals Asia. “We had long suspected the illegality in the dog meat industry and our investigation not only proved that but gave us the tools to tackle the industry too. 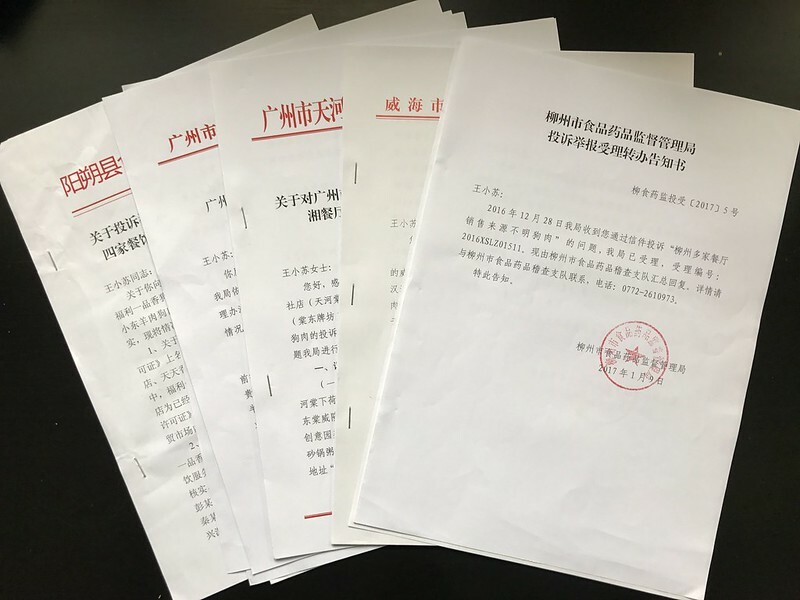 “China has laws on food safety and by pointing out infringements and ensuring the authorities uphold those laws, we have enabled local government to shut down restaurants and potentially thousands of animal lives have been saved. While the new tactic has met some opposition – with some departments unwilling to take up cases, particularly in regions where dog meat eating is more common – it is clear the illegality in the industry leaves it open to attack through legal channels. While 10 million dogs are believed to be slaughtered for meat in China annually, an Animals Asia investigation found no evidence of any large-scale dog breeding facilities, adding weight to the wide-held belief that most are obtained illegally. Animals Asia’s investigation found that every stage of the industry supply chain features illegality in order to boost profits – suggesting that if laws were upheld, the industry would be unable to continue at its current scale. “This is real progress. For so long most authorities have been turning a blind eye to the illegal transports, the lack of paperwork and the health risks of poisoned meat. But now we must congratulate them for taking these cases seriously, following through and upholding China’s laws. In addition to health concerns, widespread dog thefts with little police action have resulted in vigilante violence, which has seen both dog thieves and owners killed in brutal confrontations across the country. In June, Animals Asia launched an open letter pledging support to China’s animal advocates and asking the government to look again at the cruel and illegal way the dog and cat meat industries operate. Add your name to the letter today to help end the dog and cat meat trade in China.